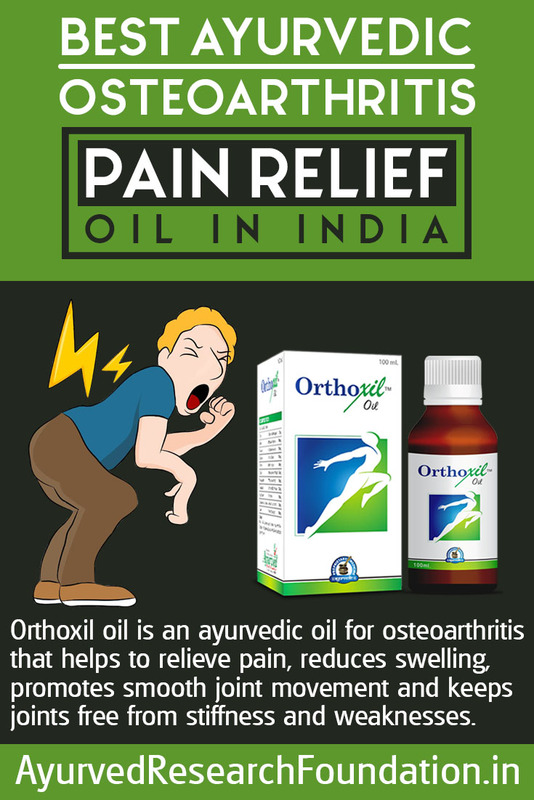 Orthoxil oil is an ayurvedic oil for osteoarthritis that helps to relieve pain, reduces swelling, promotes smooth joint movement and keeps joints free from stiffness and weaknesses. Osteoarthritis is mainly related to age, people beyond a certain age can suffer with joint weakness which cause stiffness and if not treated even make joints immobile. But certain disorders which weaken bone health like osteoporosis and other forms of arthritis like gout, rheumatism etc. can cause osteoarthritis (OA) much earlier in age. Poor diet, lifestyle and deficiencies in body also bring osteoarthritis earlier in life. 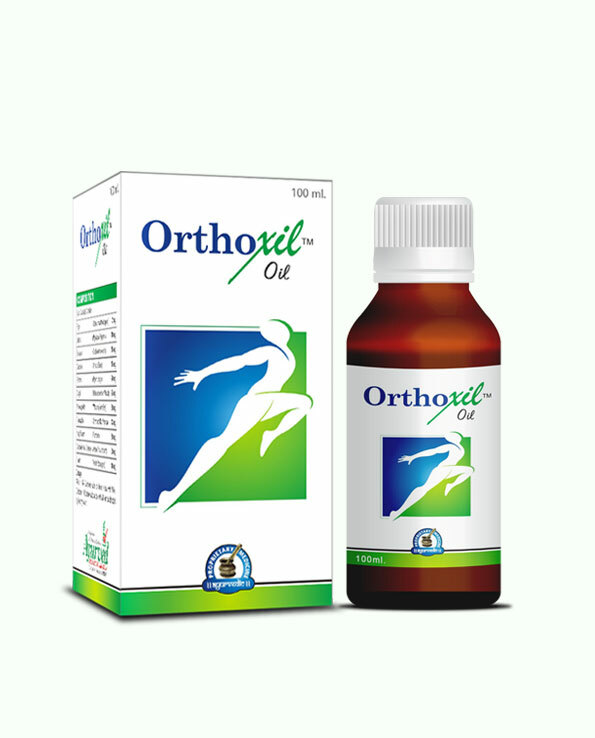 Orthoxil oil is herbal oil for osteoarthritis relief which promotes smooth and painless joint movement and gradually reduce intensity of the problem. People suffering with OA face episodes of joint pain, stiffness and swelling and later reducing range of motion, severe weakness, joint deformity and immobility. 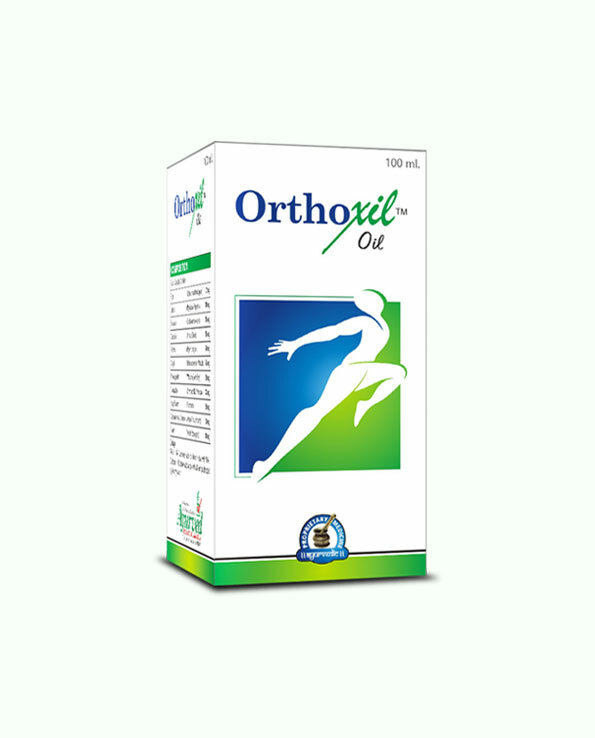 Orthoxil oil works as fast and effective herbal oil for osteoarthritis relief. Orthoxil oil possesses combination of herbs and herbal oil which go deep into skin to provide relief. This herbal oil for osteoarthritis relief numbs pain-signal carrying nerves to provide quick relief from pain and diffuse swelling to promote flow of blood. On regular use this oil promotes generation of tissues at higher rate and strengthens ligaments and muscles of the joint. Strong and healthy ligaments maintain joint stability and alignment and muscles provide smooth and painless joint movement. By increasing rate of tissue generation this herbal oil for osteoarthritis relief also help body in repairing damaged bones of joint and cartilages to increase range of joint motion and its weight and pressure bearing capacity. Herbal oil for osteoarthritis relief improve functions of nerves around joint and relieve pain caused due to neuralgia, fibromyalgia, sciatica etc. effectively and provide better control over joint movement. Herbal oil for osteoarthritis relief handle problems like difficulty in performing various activities like climbing stairs or standing up after sitting due to stiff joints. By regenerating cartilages and bones forming the joints this herbal oil for osteoarthritis relief also reduces intensity of other issues like RA, gout, osteoporosis and provide relief from problems like back pain, sciatica, frozen shoulder cervical etc. 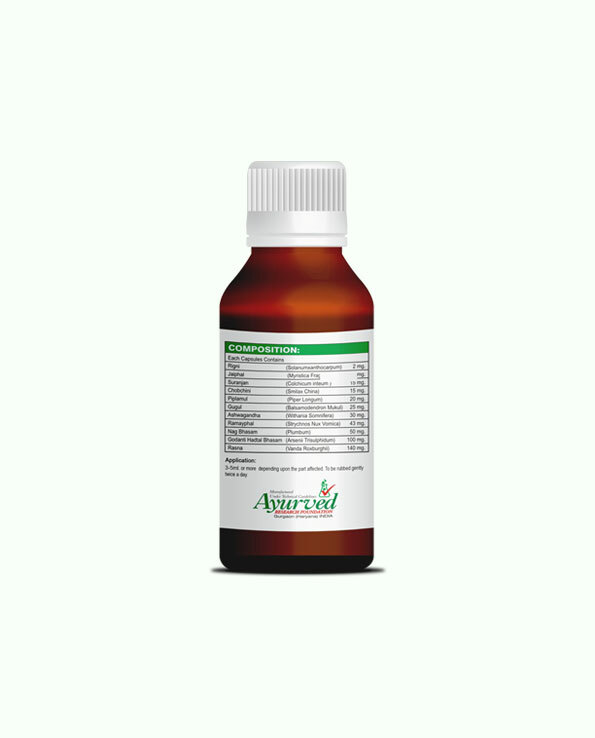 People leading strenuous lifestyles, involved in heavy jobs, suffering with deficiencies or facing any other health issue can benefit by using this ayurvedic osteoarthritis pain relief oil and not only get rid of joint pain, stiffness and swelling but prevent it from occurring by keeping them stronger and healthier. People growing in age can use this oil to reduce joint pain and swelling and also to keep joints free from stiffness and weaknesses. 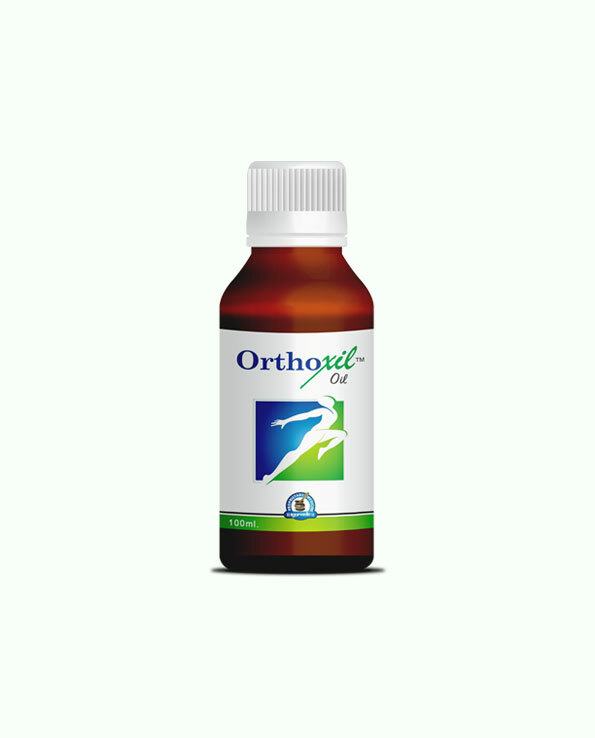 Orthoxil oil is combination of powerful herbs and herbal oils which have been used since old times to reduce joint pain and swelling, and promote healthy joints. These natural remedies cast no side effect which make Orthoxil oil completely safe supplement. People with even sensitive skin can use this oil for beneficial results. Orthoxil oil contain combination of herbs and oils which is – Ashwagandha, Asthisanhar, Arand, Rasna, Nirgundi, Guggul, Nagkesar, Piplamool, Haldi, Akarkara, Long Oil, Jaiphal Oil, Gandhpatri Oil, Gandhpurna Oil, Peppermint Oil, Tarpin Oil, Kapur Oil, Arand Oil andBuleylu Oil. Combined effect of these ingredients nourishes ligaments and muscles, and improves health of bones and cartilages to provide stronger and healthier joints. These ingredients curb pain and swelling quickly and gradually increase range of joint motion to make Orthoxil oil powerful Ayuredic osteoarthritis pain relief oil. Take 10 to 15 drops of Orthoxil and apply a thick layer of oil over affected joint, gently massage for few minutes till oil gets absorbed in skin. Repeat twice in a day and maintain regularity. How long do I need to take this oil for complete relief? If person is not suffering with osteoporosis, arthritis or other health issues duration of 4 months is sufficient for gaining good results. But in case of any joint or bone related disorder we would recommend use for 6 months at least for complete relief. Consume foods high on fibre, protein and calcium. Stay out in the Sun for at least 20 minutes in a day to gain vitamin D and perform regular exercises. You can easily send us payment for your order. If you are in India you can pay us on delivery, or you can send us a cheque, DD, or transfer through NEFT. You can also deposit cash in our account directly. You will get your order within 3 to 5 working days anywhere in India. The product will be wrapped in plain pack so that no details about its uses are evident from outside. The parcel will be hand-delivered right at your doorstep through FedEx. I ordered this for my joint pain after I got injured; it relieved my joint pain and somehow made healing process faster. It lasts longer than any other product I have tried so far. I bought this for my father for his rheumatoid arthritis problem. He got an intense relief in pain and swelling. My friend had used this for his shoulder pain and loved it, so I’ve decided to give it a try. It really relieved my back and knee pain. Would recommend to others also!! It provides great relief in muscle pain. It really helps and I strongly recommend it to others who are suffering from arthritis. I got this for my friend. Fantastic product to cure arthritis problem!! One should definitely give a try if they are having this issue. I’ve been using this oil for a while and now I’m happy with this product. I bought this oil every month for my mother, her arthritis has definitely gotten better with this. Best quality oil. I am a huge fan of Ayurved Research Foundation products; they provide the best quality supplements in the market.